From Middle English onyon, union, oinyon, borrowed from Anglo-Norman union et al. 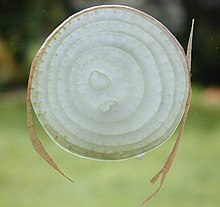 and Old French oignon, from Latin ūniōnem, accusative of ūniō (“onion, large pearl”), which had also been borrowed into Old English as ynne, ynnelēac (“onion”). Displaced the inherited term ramsons. A monocotyledonous plant (Allium cepa), allied to garlic, used as vegetable and spice. The bulb of such a plant. dorrẹ̅, dōrī adj. & n. […] cook. glazed with a yellow substance; pome(s ~, sopes ~. […] 1381 Pegge Cook. Recipes p. 114: For to make Soupys dorry. Nym onyons […] Nym wyn […] toste wyte bred and do yt in dischis, and god Almande mylk. (uncountable) The genus as a whole. (obsolete baseball slang) A ball. (colloquial, chiefly archaic) A person from Bermuda or of Bermudian descent.